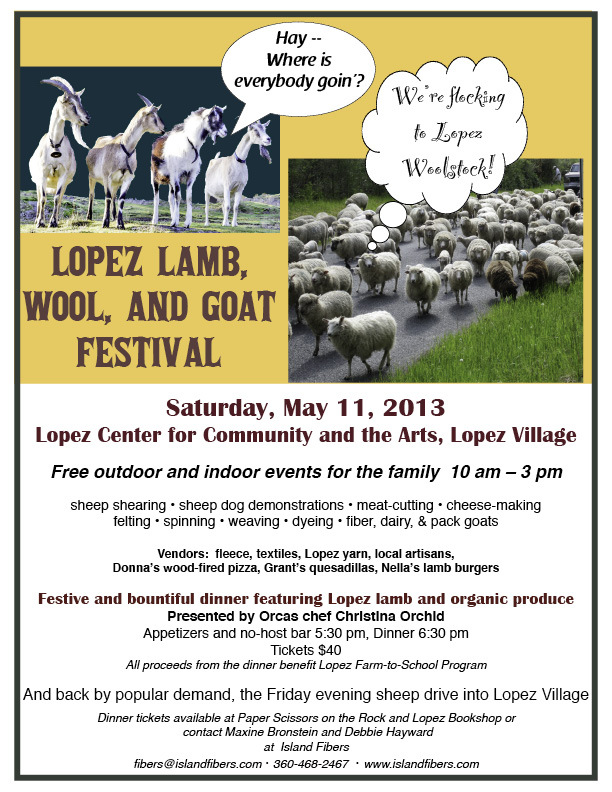 The Third Annual Lopez Lamb, Wool and Goat Festival is coming soon, May 11, 2013, to the Lopez Center for Community and the Arts. All the sheep, goat, fiber and food events that made the past two festivals such a success are happening again this year. Don’t miss it! Update: Lopez Lamb, Wool, and Goat Festival! • Food options available during the day: Donna will be firing up her cob oven and providing pizza in new and delicious ways, including a dessert pizza; Grant Silvey will be there with his hand-ground corn quesadillas; Nella Burt, at the Soda Fountain across the road, will be grilling lamb burgers; the 4-H Goat Club will have a variety of natural juices and other beverages available. • Food option for a lovely dinner: there are a few tickets left for Christina Orchid’s dinner featuring Lopez Lamb and organic produce. For several weeks in early spring, the fields around my kitchen garden are home to a flock of sheep. They are a mixed group, some raised for meat that the farmer sells locally and to Seattle restaurants and others raised for their fleece that the farmer’s wife and other spinners, weavers and knitters value. 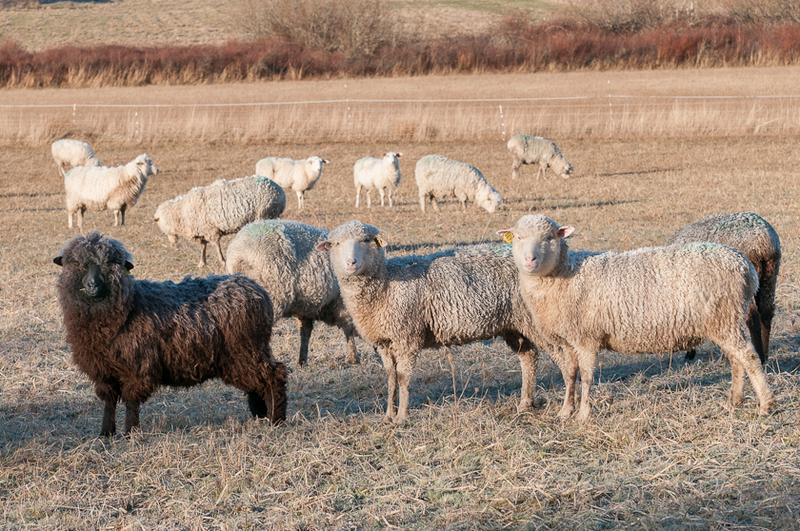 The sheep stay a week or two until they’ve nibbled down the newly sprouted grasses in our fields, and then the farmer and his dogs move them on to neighbors’ fields. 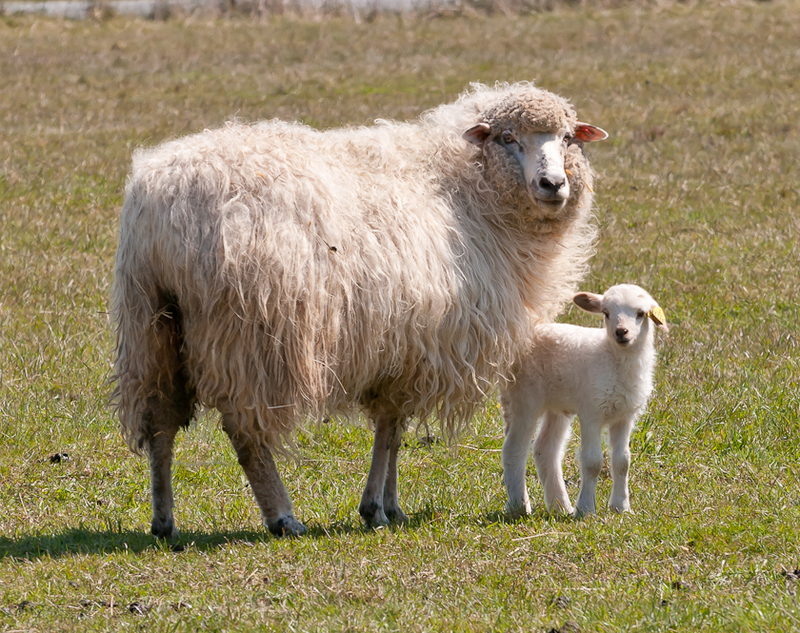 In other pastures around the island, baby lambs stay close to their mothers or jump and frolic across the grass. And in barns and farmyards, freshly shorn Romney, Coopworth, Icelandic and Navajo Churro sheep look around uncertainly, just released from the shearer and the fleece that coated them all winter, lovely fleece destined for yarn, rugs, blankets and all kinds of clothing. 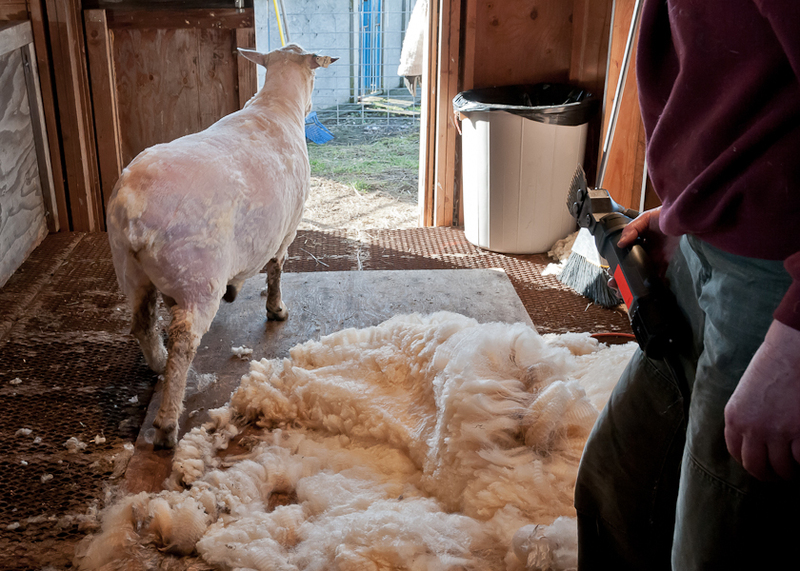 The bounty and beauty of Lopez lamb and wool is something I’ve admired each spring, feeling fortunate to have friends and neighbors who put such effort into raising sheep for meat and gorgeous fleece and for keeping agriculture vibrant on the island. Who knew these hard working farmers and fiber artists also had the energy to organize their labors into a festival so others can enjoy what I see each spring! But last year they did, offering the first Lopez Lamb and Wool Festival, complete with a sheep drive into the village, sheep dogs, baby lambs to pat, shearing, spinning and weaving demonstrations and a lamb dinner. The day was such a success that they are doing it again this year. And they’ve invited goats! This year, fiber and diary goats, and even pack goats, will join the sheep for a day at the Lopez Center for Community and the Arts. There will be demonstrations and hands-on instruction on spinning and weaving, and vendors will offer lamb and wool related items. Orcas Island chef Christina Orchid will prepare the lamb dinner this year using Lopez lamb and local organic produce and offering side dishes for vegetarians. 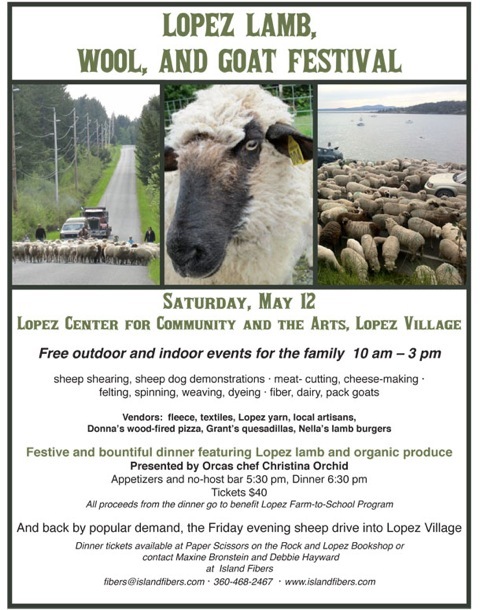 There will be an auction of Lopez grown and made woolen items and as was the case last year, all proceeds from the dinner and auction will benefit the Lopez Farm-to-School program to encourage future generations of farmers. This year’s festival sponsors are Island Fibers (http://www.islandfibers.com/), Saddleback Sheep Ranch, and the Agricultural Resources Committee of San Juan County (ARC). Check out this poster for more details and come if you can. It will be great!